points de votre première récompense! Évaluez Hotel Dieu-Grace Hospital pour gagner des points! S'il vous plaît connexion ou créez un compte gratuit pour modifier Hotel Dieu-Grace Hospital. Hôtel-Dieu Grace Hospital is this region’s premier tertiary acute care hospital. 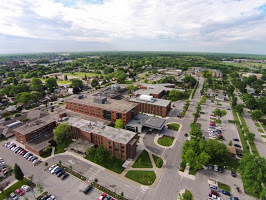 Combining a century-old tradition of compassionate care with cutting-edge diagnostic imaging technology, HDGH leads the provision of advanced care in the areas of complex trauma, renal dialysis, acute mental health, cardiac care, stroke and neurosurgical, and the broad foundation of medical and surgical services required to support these areas of specialization. Aucun abonné pour Hotel Dieu-Grace Hospital. Suivre Hotel Dieu-Grace Hospital maintenant! everytime i've been there the staff has been super-friendly and it's pretty clean. Avis: I had four surgeries starting 2003 to present. Very good care, each room from Surgery department (6-th floor) was cleaned several times per day and staff was professional and friendly.